No poo = green cleaning for your hair! Before washing, I divided my hair into four sections, dampened it with water, and deep conditioned as usual. Once in the shower, I slowly added enough water to the bowl of baking powder to create a thin paste. Working section by section, I first rinsed the conditioner from my hair with water then massaged the baking soda paste into my hair, working from the scalp to ends. I used a duck clip to rebind each section before moving on to the next. Once my entire head of hair was cleaned with baking soda, I began the rinsing process on each section. First rinsing with water directly from the shower head, then sealing my hair with 1/2 cup of the rose-lavender-ACV rinse. I think most people rinse again with water, but I didn't. Maybe another time I'll try it that way. Truth be told, I don't wash my hair often so I was surprised by how clean the baking soda got my hair and scalp. The entire process left my hair feeling and smelling extremely clean. It looks very shiny too. I would absolutely wash my hair with baking soda again. I don't have a problem with SLS-free natural shampoos (in fact, I'm kinda in love with Alaffia, especially their Beautiful Curls line), but it's nice to have a plastic container-free, supersimple, and supercheap option under my sleeve. I think this would be especially convenient when traveling since I'd get to sidestep the whole TSA approved carry-on sizing issue and it's light. 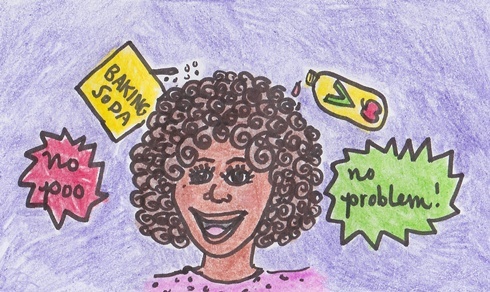 Have you ever washed your hair with baking soda? Would you try this? Hey Oliva, great post. I couldn't help but notice you shampoo AFTER you condition. Is there a particular reason why? when do you detangle? Great questions! I detangle my hair by wetting it first with water. Then divide it in sections. I then comb copious amounts of either warm coconut oil, olive oil, or Beautiful Curls deep conditioner through each section. (I either braid or clip each section when I'm done.) This detangles it. I then pop on a shower cap and a hat and chill out for 30 minutes. I condition first because: 1) I like to condition my hair for 30 minutes 2) I don't want to spend 30 minutes in the shower. I'd rather spend it eating snacks, surfing the internet, or drawing- all things you can't do in the shower (except for eating, if you're on GIRLS apparently. LOL!) 3) the ACV rinse and/or herbal rinse acts as a second conditioner. Occasionally, I'll use a lighter store bought conditioner instead. 4) I always end up putting coconut oil, olive oil, or, sometimes, leave-in conditioner on my hair when I style it anyhow and that seems good enough to make my hair strong like bull. I've tried deep conditioning after shampooing before and I didn't notice a difference in my hair. I was just in a worse mood because I had to shower twice. Of course, this is what works for my hair- which is very, very tightly coiled. Your hair may have different results from the same activities. I feel like you should just experiement. The worse that could happen is you have to wear your awesome hat. Win-win! "Industrial pollution begins in the womb." Laundry Soap That Grows on Trees. Seriously!